I was lucky enough to connect with Chefs of like minds who had the same goals regarding what the consumer wants. We believe that farmers are becoming a thing of the past and a true appreciation for the plight of the farmer is quickly going with it. In order to show appreciation for the fresh bounty farms provide we came up with a unique idea in which we would hold culinary events and use the proceeds to give back to the farmers who feed us. With the belief that fresh local ingredients such as organic vegetables has become a desirable commodity on a restaurants menu we banded together to form the Chef Cooperative. We wanted to showcase all that is Texas and give back to the farms that feed us. Since we started we have expanded to include distilleries, vintners and craft beer makers with the help of some of the best San Antonio bartenders. Together we create culinary events with our group of chefs creating their own dishes, seeking donations for ingredients and often contributing from our own pockets to provide the dinners. We then take 60 percent of the profits and give them back to the farming community. The remaining money then goes towards funding the next event. When we started out we did not have that 40 percent to put the dishes together and had to go out and get food from donations, the restaurants we are working for and any other means possible. The proceeds are put to good use by farmers who can then put more money into their farm and equipment and improve their efficiency and ability to keep up with higher demands from our group of Chefs. It is a win win situation. Together we are bringing a whole new communal approach to the restaurant business. Our success has allowed us to expand our efforts with two new projects on the horizon. We are excited about a new catering company called Farm2Fork. It will work under the same premise and we are already seeing interest from community groups and private individuals who are dedicated to the farm-to-table concept and are not willing to compromise their beliefs even for major events. Our menus will be developed by our Chef Cooperative members. We are forging long lasting relationships with the people who have always provided our food. We are able to offer them something they had never had available to them before which allows them to invest in their own success. These are not hand outs, but instead a way for us to give back to the people who responsible for the food on our tables. Buying locally plays a huge role as it allows Chefs and Farmers to build long-lasting relationships. Farmers and ranchers in the San Antonio area will be supported as we band together with a commitment to buy local meats and produce that are of benefit to us as these farmers and ranchers work hard to offer strong products and fill out seasonal menus with fresh food choices. This is also an important business approach as it allows us to use sustainable products and promote the south Texas Farm –to-Table movement. The Chef-Farmer relationship is an integral part of the restaurant community as without them our dishes and cuisine would not exist. It creates a mutual respect between the labor of the farmers and the feast we can prepare to celebrate their bounty. And local is important as it helps stimulate the local economy through the efforts of both restaurants and farmers. It is all about the local farmer and their struggles not large industry farmers who already have the machinery and field workers needed for mass harvesting. It allows small farms to remain competitive. It also embodies educating people about the food they eat and what they put into their bodies. Providing farm fresh, organic ingredients shows people what they should be eating, the nutrition of farm fresh options and raises awareness of what is available right in their own backyards through their local farmers. 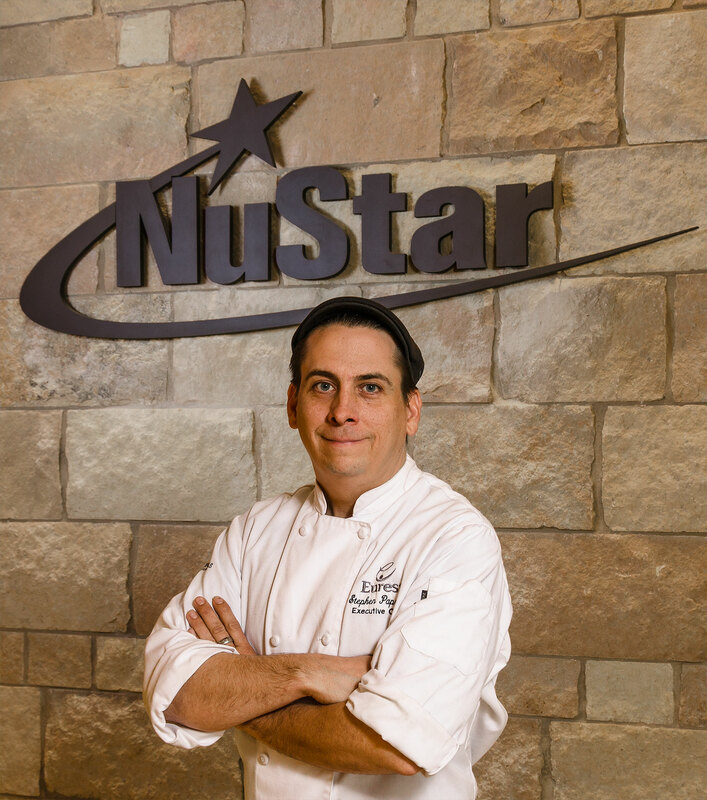 I am completely dedicated to using the freshest possible ingredients and actually have a 22-by-60-foot outdoor garden at NuStar Energy’s Grill on The Hill Cafe, where I work as the Executive Chef for Eurest. I grow herbs and squash and also have an indoor aquaponics garden. In my latest endeavor TopChefa Food Beverage and Entertainment Consulting LLC, as a restaurant consultant I continue to look for solutions and partnerships with Texas-grown food companies whenever possible in a continuous effort to promote the farm-to-table concept. It also teaches chefs and restaurant owners of the sustainable options out there whether they get into the hyper fresh trend of growing their own fresh produce and herbs or embracing the local harvest.